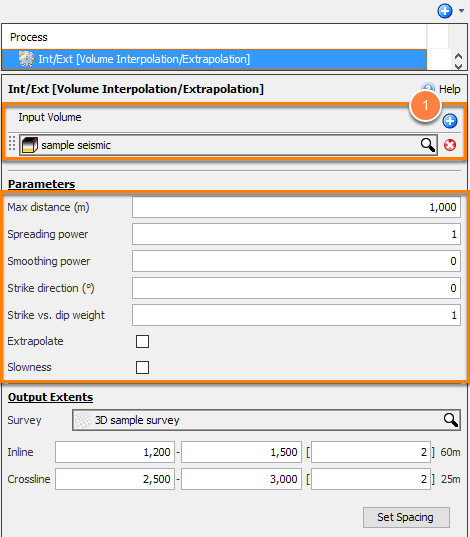 Description Interpolate/extrapolate volumes to fill a 3D region. 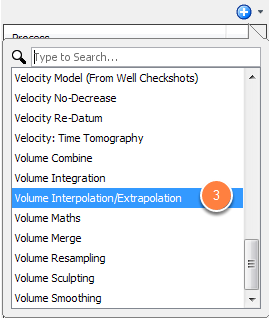 Volume Interpolation/Extrapolation creates a filled 3D region from input data, using interpolation and/or extrapolation as required. The algorithm is a combination of natural neighbour and inverse distance weighting, according to the parameters. By default, the output extents cover all the input volumes. Output must be made onto a 3D survey. Note: All input volumes must have the same vertical extent and increment. Select the input volume(s). Click the blue (+) to include additional 2D or 3D volumes. At Max distance (m), enter the maximum distance to search for data. Any point further that this distance from the input data will be interpolated. During extrapolation, this parameter has no effect. Spreading power defines the weighting applied to the natural neighbour interpolation. Enter the value for the voronoi area weight used in the process. By default, this is set at 1.0. Use values more than 0.0 if circular artifacts appear in the result (caused by joints jumping in and out of the natural neighbour set). Smoothing power defines the inverse-distance weight. By default, it is set at 0. Strike direction (degrees) defines the direction to apply any strike vs dip weighting. E.g. To guide the result for data trending in a 45 degree direction, specify 45 degrees and increase the strike vs. dip weigth. The Strike vs dip weight defines the weighting factor applied in the strike direction, i.e. applying a value of 3 results in a point in the strike direction has three times more influence over another point the same distance away. Check Extrapolate to output data to the full extent and fill all gaps. The Max distance (m) field is disabled. Check Slowness to safely operate on velocity models. Calculations are performed in slowness (1/V) and converted back to velocity. This check box is selected by default if a velocity volume is selected. Note: Always enable Slowness when workiing with velocities to accurately maintain the time-depth relationship. Consider using the Velocity Conversion Process to accurately resample and convert velocity data. Select the output survey for the resulting volume. This process creates a new 3D volume in the Volume tab. 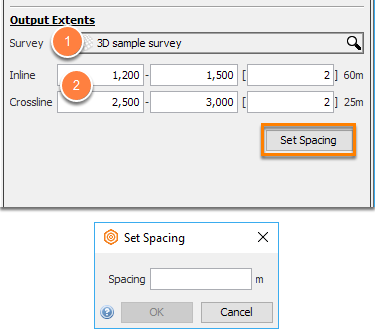 Note: Use Set Spacing to quickly set an inline/crossline sampling distance.